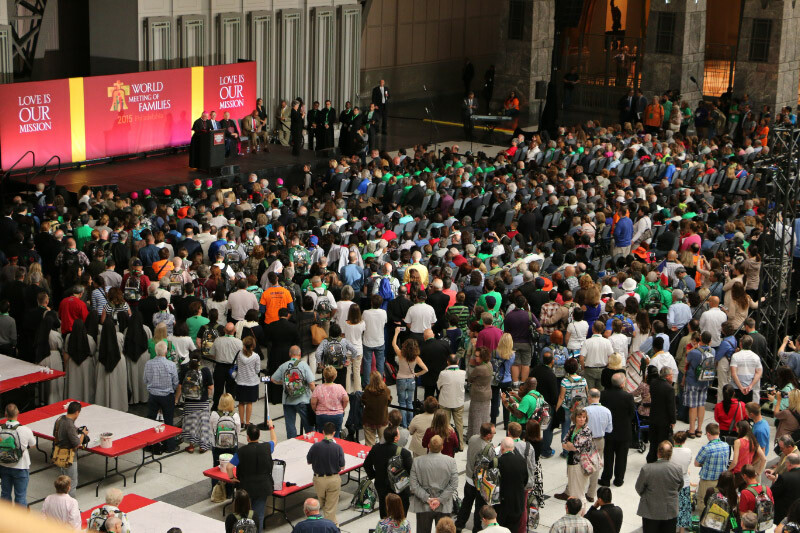 Three years of preparation culminated in the opening of the Eighth World Meeting of Families in Philadelphia on Tuesday, Sept. 22, as 18,000 people filled the halls of the Pennsylvania Convention Center and surrounding blocks in center city. Organizers said the number far exceeds the 7,000 attending the last World Meeting in Milan, Italy, making the Philadelphia event the most successful such event since it began in 1994. The Vatican’s Pontifical Council for the Family sponsors the World Meeting every three years in a different city. Catholics and non-Catholics came here from around the country and, as was evident by their traditional attire and a multitude of languages in the air, from more than 100 countries around the world including those in Asia, Africa, Latin America and Europe. Donna Crilley Farrell, executive director of the World Meeting, said before cutting a ribbon with other city and church dignitaries to open the congress officially that the pilgrims coming the farthest to Philadelphia were from the Philippines, at more than 8,500 miles away. Others traveling great distances were from Vietnam, Kenya, Buenos Aires and, practically around the corner in suburban Philadelphia, Wayne, Pa. – just 13 miles or a half-hour train ride away. Philadelphia Mayor Michael Nutter welcomed all the attendees to “the city of brotherly love and sisterly affection” before pronouncing that after all the planning especially in the past 12 months, “It’s game time in Philadelphia. We’re ready to go,” he said. Nutter presented two gifts intended for Pope Francis when he arrives in Philadelphia Saturday morning, Sept. 26, after stops in Washington, D.C., and New York City this week. In addition to a large, white ceramic bowl depicting images of the city’s historic roots and ideals, he also presented a white, locally made bicycle for Pope Francis, presumably intended for the 78-year-old pontiff to travel ecologically through St. Peter’s Square in Rome. 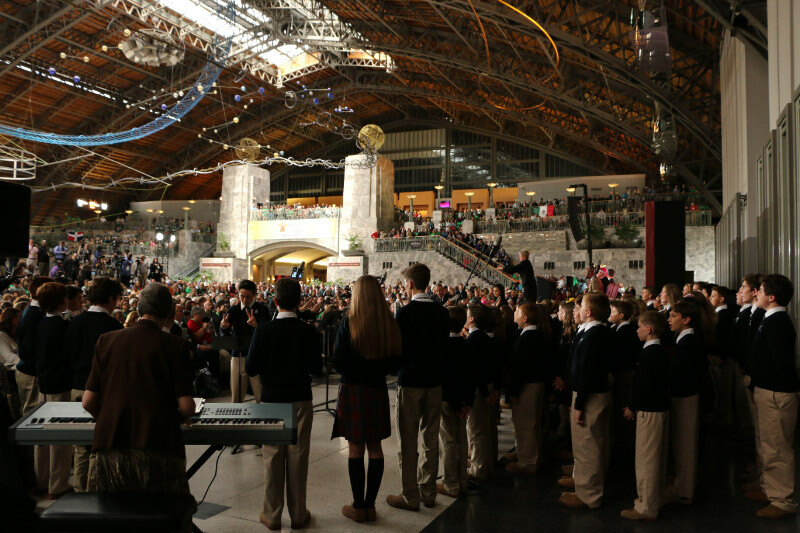 On the stage with Nutter in the convention center’s cavernous Grand Hall, a converted 19th century train shed of the former Pennsylvania Railroad, was Archbishop Charles Chaput, who echoed the mayor’s sentiments but with a message of faith for the participating families. Participants streaming through the convention center seemed to radiate those three divine gifts already, before even the first of the conference began – a late afternoon keynote talk by Los Angeles Auxiliary Bishop Robert Barron. Don and Sharon Otto, parishioners of St. Teresa of Avila in Norristown, usually attend the Archdiocese of Philadelphia’s Parish Life Congress, an annual day of faith enrichment, but the couple has never witnessed a gathering such as the World Meeting of Families. Don in fact was raised in the Baptist Church tradition, but after his marriage to Sharon almost 20 years ago, he joined her in the Catholic faith. He went on to become a member of his parish’s RCIA team to welcome and prepare potential converts. The sight of so many thousands of people, many of whom wore color-coordinated shirts or hats to identify their parish or diocesan group, presented a picture of happy families eager to learn more about the family and share stories with families from across the globe. Father Thomas Dailey, an Oblate of St. Francis de Sales who holds the Cardinal John Foley chair of social communications and homiletics at St. Charles Borromeo Seminary, is an expert in church communications. He believed the 3,500 accredited media covering the papal visit, some of whom also are covering the World Meeting, will cover the controversial questions of family life such as homosexuality and divorce in addition to well-known personalities, but they will also report on the positive atmosphere of the events. He thinks the witness of tens of thousands of families is itself the most powerful story. Meanwhile across the city at the Cathedral Basilica of SS. 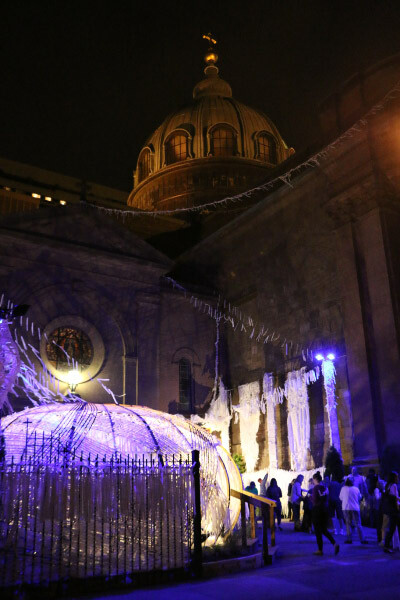 Peter and Paul, hundreds toured the historic church and milled around the “Knotted Grotto,” an art installation featured more than 30,000 ribbons knotted into a lattice structure. Each ribbon represents a prayer intention, which visitors may read and offer in their prayers, as well as adding a new ribbon. Volunteers were handing out blank ribbons to visitors, and busily placing completed ribbons at the exhibit. Many, if not most, of the ribbons included prayers for people in recovery or struggling with addiction, as well as joblessness. Above all the ribbons hung a large portrait of “Mary, Untier of Knots,” a devotion to the Mother of God as one who unties the knots of people’s lives. When Pope Francis arrives in Philadelphia on Saturday, he will stop at the front of the cathedral. A stroll of about 30 feet from the front doors to the grotto is not planned for him, but he will likely notice the prayer ribbons to Mary, the Undoer of Knots, to whom he also is said to have a devotion.